The second season of Channel Cheese – four delicious episodes on 1 disc, including: our visit to the Dolomites Cheese Route; profiles of French, Australian and Italian cheese-makers; and our cheese-lover’s guide to Paris. Price includes postage and packaging. Please note our DVDs are PAL system, and will generally not be compatible with NTSC players. 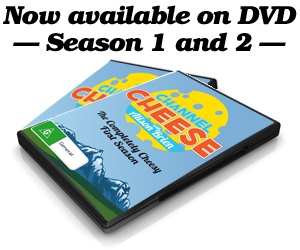 The complete first season of Channel Cheese, on two DVDs. Includes: highlights of the Slow Food Cheese Festival in Italy; visits to cheese-makers in Australia, Italy and the US; tips on matching cheese and wine from cheese guru Max McCalman and more. Price includes postage and packaging. Please note our DVDs are PAL system, and will generally not be compatible with NTSC players.